Fortier was the Co-Op’s first—and along with Mastrianni, only—President having served from its incorporation in late 2010 through 2014. Fortier stepped down when he was elected President of the Keene State College Parents Association. 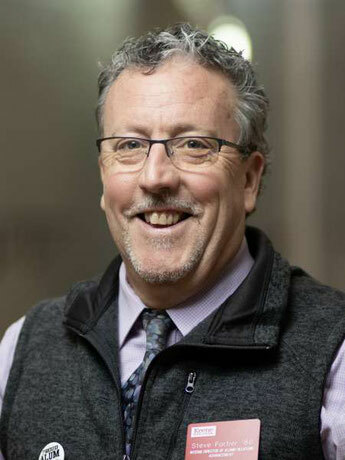 He had served as Executive Director of Meeting Waters YMCA for 19 years before becoming Keene State College’s Director of External Relations in May of 2017. Under his leadership, the regional Y—which serves the Fall Mountain, Bellows Falls, Brattleboro and Springfield regions—received numerous national awards for its initiatives to strengthen the health of youth, adults, families and communities, including improving access to healthy foods. Fortier’s main focus at this time is on recruiting a strong and diverse board that brings together the skills and experiences necessary at this stage of the organization’s development. “We need more expertise on our board and committees in retail management, business start-up, events management, and fundraising. We also need to better reflect the region we’ll serve… so, we need people with skills in these areas who work or live on the Vermont side of the river, in particular,” Fortier adds. Co-Op members interested in getting more involved in moving the project forward are encouraged to contact Steve Fortier at president@greatriverfoodcoop.com or 603-903-2602. If you are not yet a member, we encourage you to join here. More frequent updates can be found on Facebook - so please join the conversation there!